This week’s photo challenge topic is Satisfaction. 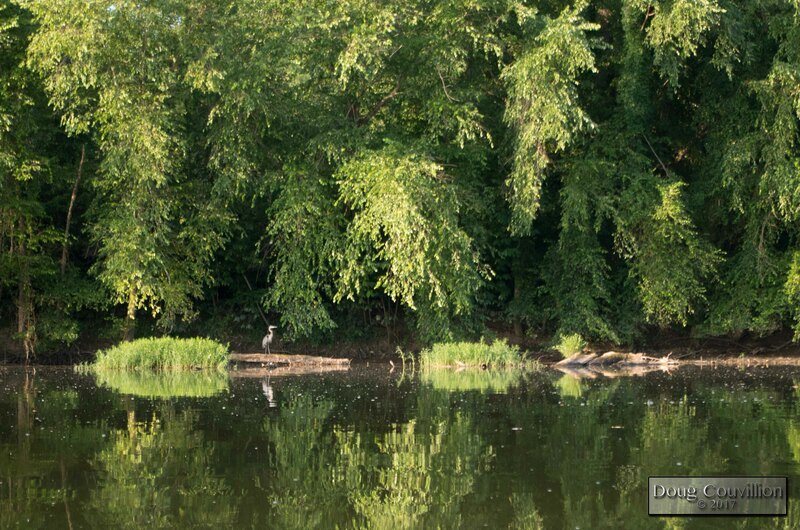 I batted a few ideas around and ended up with this photograph taken on a recent visit to the James River. You may not see anything satisfying in the photograph but that’s okay. I’ll explain. I frequently paddle parts of the James River early in the morning. Arriving at the put-in near sunrise on a week day almost guarantees I’ll have the river to myself. Most mornings I can’t image a better way to start the day. Sure I have to get up early but paddling along silently I witness the river waking up. Herons patiently wait for their breakfast to swim by. Geese call to each other and practically water ski as they land on the river. Ospreys patrol from above searching for fish near the surface. Chimney swifts circle and dart, catching insects on the wing. On a really good day I might see a river otter or a bald eagle. The morning I took this photograph was one full of quiet, majestic wonder. Paddling toward the take-out I saw a great blue heron on the far bank. The photographer in me immediately wondered how close I could get to the heron. Great blues are skittish and not easily approached. Then another thought came to mind. For me the river was an escape, a way to ease into the day without any stress or worry. But for the heron the river was a source of food, a means of survival. It was depending on catching fish. Steering clear of the great blue I let it fish undisturbed. I was deeply satisfied just being on the river watching the morning unfold. Thanks. I’m sure the heron was happier I kept my distance. Very nice! Love your skills. Nice reflection of the heron.